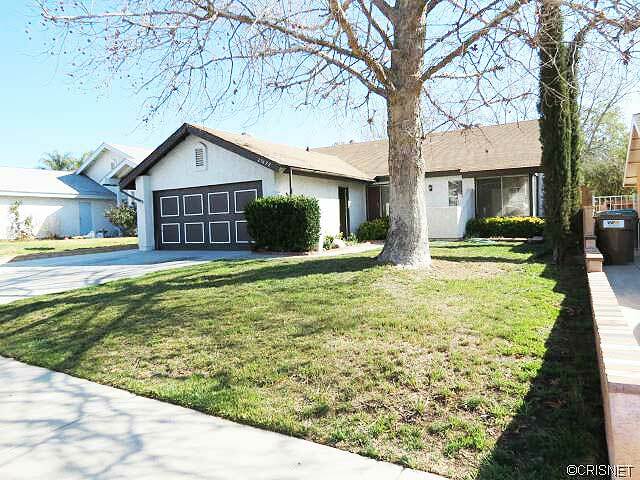 Check out this New Listing at 27632 Cherry Creek Drive, Valencia, CA, 91354 as of 02/21/2014 in Valencia North. This great home is located in the Valencia CA real estate area of homes for sale in Santa Clarita CA. The Today Homes tract is found off Seco Canyon Blvd. This home has 3 bedrooms and 2 baths and 1263 square feet. This is a standard sale. This lovely home is located just off Seco Canyon Blvd with great freeway access. Easy access to the Santa Clarita park and Santa Clarita elementary school. There is no home owner association and no fees. No Mello Roos. See more below. Wonderful curb appeal welcomes the next homeowner desiring a great home within great school district. Walking into the home provides high vaulted ceilings and beautiful neutral tile throughout. Kitchen with wonderful tile counters. Fresh landscaping in the backyard with room on the side for a dog run. Freshly painted interior. Home has copper plumbing, newer AC unit and newer water heater. Bathrooms have been remodeled nicely and with tile showers and flooring. Master has his/hers closets, wardrobe mirrors and updated bathroom. This home at 27632 Cherry Creek Drive, Valencia, CA, 91354 is located off Bouquet Canyon and Seco Canyon Blvds. This is a standard sale. Schools for this home are Santa Clarita Elementary School, Hart High School. All excellent schools and one of the reasons many new home owners with children find reason to purchase in the Today Homes tract aside from the fact there are no HOA fees. LargeSanta Clarita park nearby as well as the Santa Clarita biking trails.